"Okay Google, tell me who is better iPhone or Android? What can an Android do that an iPhone can't? Why is Android popular? Which one is better iPhone or Android? Should I get an iPhone or Android? Android vs. iOS pros & cons" - these are the most popular questions & terms most buyers search on the Google. Are you also planning to buy a smartphone? Which phone are you interested in Android or iPhone? Confused with which will serve you the best results for your needs? Let us talk today about which is better & which beats the other. Android is better mobile operating system as compared with iOS and so the mobile phones. Today, the mobiles phones have turned to smart phones. They are not just remained as a contacting device but are much more for us. The smartphones offer several functions, facilities, flexibilities and much more. Well, there are several smartphones available to choose from along with options for selecting mobile operating systems. Broadly speaking; actually, we have two options to choose from, namely Android and iPhone. Both of them nestles with the several features, strength, and weaknesses. The Android platform is much reliable than Apple's platform. No doubt, Apple's iPhone is much attractive and grab a lot of attention, but still, there are a number of reasons people avoid buying them. On the other hand, the Android platform is much simpler to use and is much flexible providing the lots of functionality. Let us figure out which one is better and ideal for you! Here are I have listed most important reasons to prove how the Android phones are better than that of Apple's iOS iPhones. 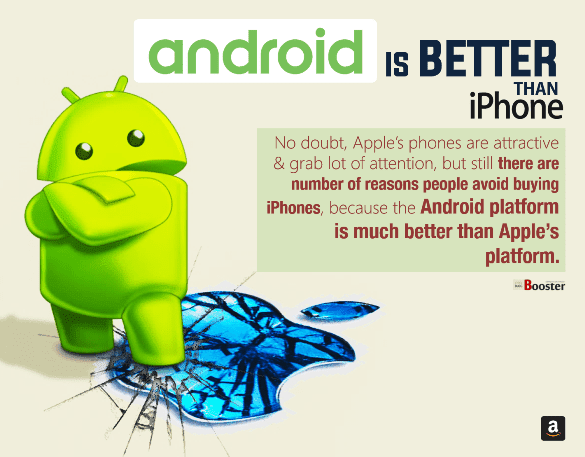 25 Practical Reasons Why Android Is Better Than iPhone? According to me and the data, I have accumulated, its seen that the Android is better than iPhone; I arrived at this conclusion after a lot of work on finding and comparing the advantages + disadvantages of both. And after reading this, many of you also get agreed that the smartphones packed with Android are much better than those are based on iOS. 1. The Back button on Android phones is simple and helpful to return to a previous screen which is NOT available on iPhones. 2. Customization of the Android phone is much easier and better than the iPhone. You can easily download a third-party keyboard app, launcher, etc. If you do not want that inbuilt one; it is very easy to change phone’s interface, arranging apps, etc. as per your wish and like. 3. Same charging cable for most of the Android phones. To charge the Android phone you can use any micro-USB cable while iPhones need specially designed Apple’s proprietary lightning cable. 4. Notification - On the top of the Android phone, you find notifications which make it easier to check and respond to very quickly. The iOS also has this facility, but Android has a much better user interface and replies directly from notification without opening any app. 5. Phone lock options - It is easy to protect the Android phones from being used by any other person with the several options like patterns, face-lock, fingerprints, password, number lock, and voice unlock options; it is easy to lock and unlock the device. Whereas, iPhone allows few options consisting only of the fingerprint, password, face-unlock & num lock facilities only. 6. Apps Flexibility - It is very easy to download the apps directly from the Google's app store to your PC or in the Android phone. You can easily share apps files like apk files with each other directly via WiFi too. On the other hand, iPhones need iTunes or App store to be downloaded first. 7. Rich Google Maps - The inbuilt maps applications nestled in the iPhone are not as good as Google’s. The Android phones offer an excellent view of roads and work flawlessly with the Google’s official 'Map App'. 8. Home Screens - Android allows the creation of several home screens and stores the apps on different home screen pages as per your need. This facility is not available with iPhone. This empowers the users to access favorite apps quickly. 9. Strong OS built - The Android developers have done their job perfectly, the software built & the functions of the operating system of Android phone are the BEST in the market. Especially for updating the official firmware, you just have the one-click restore function from PC. 10. Work with multiple apps - Android phones support the opening of multiple apps at once and here you can work on all the opened apps at the same time. The iPhone also has this facility but Android switching is much easier and faster. 11. External memory options - Most of the Android phones serves expandable memory. You can comfortably insert a micro SD card and can expand the memory of your smartphone with many folds. Whereas, the Apple never allows memory expansion. The Apple phone with bigger storage comes with bigger charges. 12. Price comparison - The prices of iPhones are very high while smartphones with Android platforms are much cheaper. 13. Detachable battery - Yet one more strength of Android phones is, its removable battery. If any problem arrives, you can easily take out the battery and go to the service center for repair. While iPhone doesn't provide the removable battery. It is not at all worth to keep your iPhone with the service center for even a simple battery repair. 14. Long durability - The Android phones offer excellent durability when it comes to its body. They are made out of durable aluminum along with the glass fronts and backs. You can even watch online the bend test of Android phones and iPhones. 15. Water resistant - Most of the Android phones are water and dust resistant while only latest version iPhone 7+ adapted this feature. 16.Infrared Control - The Android phones render one more quality of IR or Infrared blaster to control the devices. 17. Personal account adaptability. Any Android-based mobile devices provide you to work on the multiple user accounts. This feature makes you share your Android tablet with your family and co-workers. 18. Charging options - Android phones get charged easily either wirelessly or with cable. This option is now also available but for new devices of iPhone. 19. The cloud services of Google are excellent, cheaper and work adequately with Android phones. 20. Cache, RAM Control - Android phones support option to clear the cache and make space for new apps. 21. File Sharing - Android phones allow sharing of files, audios, videos or any data via Bluetooth/WiFi/IR with any of the devices. iPhone doesn’t allow sending or receiving data or files from any device that doesn't have iOS. 22. Hardware built up - At the same time, according to the troubleshooters, the hardware of Android phones is much better than iPhones. 23. File manager - The smartphones packed with Android OS are more able to access the files from its storage devices or memory cards. It is easier to access all the files on your Android smartphone with help of simple file manager app. 24. No.1 app market - For Android OS, the users can choose their desired apps from 2.5 million+ apps from Play Store. The Android has a leading app store as compared to iOS. 25. High competition to provide best - Most importantly, the Android phones offer an endless amount of choices. There are so many brands coming with Android phones allowing you to choose from different colors, best camera features, HD quality resolutions, Quad HD screen, big or small display sized options, etc. On the other hand, the iPhones offer restricted choices of selecting smaller or bigger screen sized iPhones, and the new models are the same as the previous one. There is like a sea of Android phones with lots of choices and options. Ultimately, we arrive at the conclusion that Android phone can be a smart investment. Android phones overpower the strengths as compared to iPhone delivered from the Apple brand. Choose your Android smartphones from the sheer variety offered by top-level manufacturers. Invest your fix money in the most hi-tech Android phones manufacturers like Samsung, Motorola, ZTE, LG, HTC, Sony, Huawei, and other top brands. The best of Android phones is all these brands launch newer and better versions nestled with cutting-edge technologies that too without labeling the price tag too high! No doubt, you will be served with the top-notch device that delivered top drawer strengths and advantages.